German mathematician; born at Düsseldorf April 24, 1849; educated at the University of Bonn, where he became assistant in the institution of physics in 1866. In 1868 he received his degree of Ph.D. and took a postgraduate course at Berlin and Göttingen. He became privat-docent at Göttingen in 1871, and in the following year was elected professor of mathematics at the University of Erlangen. In a similar capacity he went to the technical high school at Munich in 1875, to the University of Leipsic in 1880, and to the University of Göttingen in 1886. In 1893 he represented the German empire as a member of the educational department at the Columbian Exposition at Chicago, and in 1898 he represented his country at the conference in London which established the International Catalogue of Scientific Literature. Klein was appointed one of the editors for the publication of Plückler's unpublished works. 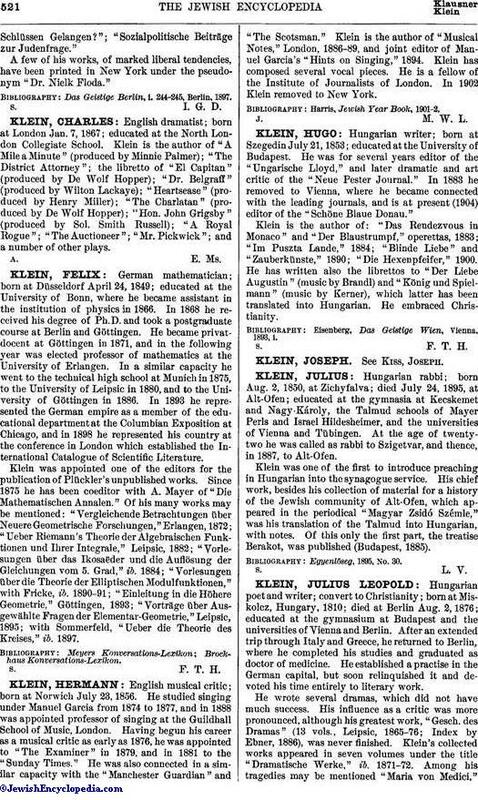 Since 1875 he has been coeditor with A. Mayer of "Die Mathematischen Annalen." Of his many works may be mentioned: "Vergleichende Betrachtungen über Neuere Geometrische Forschungen," Erlangen, 1872; "Ueber Riemann's Theorie der Algebraischen Funktionen und Ihrer Integrale," Leipsic, 1882; "Vorlesungen über das Ikosaëder und die Auflösung der Gleichungen vom 5. Grad," ib. 1884; "Vorlesungen über die Theorie der Elliptischen Modulfunktionen," with Fricke, ib. 1890-91; "Einleitung in die Höhere Geometrie," Göttingen, 1893; "Vorträge über Ausgewählte Fragen der Elementar-Geometrie," Leipsic, 1895; with Sommerfeld, "Ueber die Theorie des Kreises," ib. 1897.